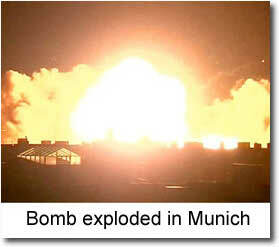 In August 2012, a construction crew in Munich, Germany discovered an unexploded bomb from WWII. Munitions experts weren’t able to defuse it, so they evacuated 3000 residents and detonated the 550-pound bomb. The problem, you see, is that bombs don’t go away. They go off. And that’s why it’s a good idea to cooperate with the Holy Spirit, inviting Him to shine His light of truth on the unexploded bombs in our hearts and minds: unresolved conflict, unexpressed grief and pain, unconfessed unforgiveness. A couple of my friends sustained hurtful childhood traumas. No one helped them process the pain and shock of abuse, bringing it out into the light and speaking healing truth to them. Their emotional pain generated anger and frustration that always simmered just under the surface. Triggered by situations, words, or body language that vividly reminded them of how they felt as children, they would explode in rage, destroying relationships and jobs. As they exposed their “bombs” to the Holy Spirit, He defused them with truth: It wasn’t their fault. It wasn’t right. And His tender compassion ministered grace that brought healing to their hearts. Another friend was raised in a cult. Evil people in what she called a dark circle planted “bombs” in her young mind—threats of certain hurt and danger if she ever dared to believe in Jesus and connect with Him as a Christian. The unexploded bombs consisted of promises that they would come find her and hurt her, and lies about the true God and about the power of Satan. When she did become a Christ-follower, she dared to invite Him to deal with her bombs. He defused them with the truth that He had conquered Satan and his demons at the cross, disarming them, making a public spectacle of them, and triumphing over them (Col. 2:15). Yet another friend was mercilessly bullied every single day of her school career. The abusive ridicule and insults she took, day after day, planted bombs in her heart: lies that she was worthless, lesser-than, unloved. When she gets overwhelmed, the bombs can explode into throwing things and even her cat. She is finally facing the need to grieve her still-buried pain and eventually forgive those who bullied her. Grieving and forgiving will defuse my friend’s bombs, but as of today, she sits on a ticking bomb every day of her life.